On Monday morning, WikiLeaks released thousands of emails related to Emmanuel Macron’s presidential campaign in France. The release comes almost three months after Macron’s campaign was hacked two days before his election. The site released more than 71,000 emails — 21,075 of which have been verified through “domain keys,” the organization said in a statement. The documents range between March 2009 and April 24, 2017. Macron’s campaign issued a statement May 5 saying a major hack had put thousands of emails and internal communication at risk. The hack did not reveal any smoking guns and Macron went on to beat populist Marine Le Pen in a landslide vote two days later. An investigation into the hack concluded that it was the result of “an isolated incident” that could have been carried out by anyone. “The attack was so generic and simple that it could have been practically anyone,” Guillaume Poupard, the head of France’s cyber security agency Anssi, told the Associated Press June 1. This is not the first time Macron’s campaign emails have been released. Days before the election, thousands of emails related to the campaign were released. Due to French law, local media was banned from reporting on the contents of the emails. France’s electoral commission warned media and internet users that they could face criminal prosecution for publishing documents obtained in a “massive and coordinated hacking attack” on the presidential frontrunner Emmanuel Macron’s political movement. The commission, which held an emergency meeting to discuss the leak, said some of the documents appeared to contain “false information”. Thousands of internal En Marche! (On the Move!) documents were published on the internet an hour before the Friday midnight deadline for the start of a campaign blackout, meaning neither Macron nor his far-right Front National rival Marine Le Pen was allowed to respond. France’s presidential electoral authority, the CNCCEP, asked the media to avoid transmitting information from the leaked documents and reminded them of their responsibilities given the “seriousness of the election”. The emails were leaked on 4chan. Le Monde said it had seen part of the documents. It said the hacking attack was “clearly aimed at disturbing the current electoral process”. The paper said it would not publish the content of any pirated document before the second round vote was over and the results known at 8pm on Sunday. About 9GB of data was posted by a user called EMLEAKS to the document-sharing site Pastebin, which allows anonymous posting. It was not immediately clear who was responsible. The documents were posted as #MacronLeaks on social networks in the .eml format and linked to Pastebin. Le Monde reported that the first documents were relayed via the 4chan forum, which it said was favoured by far-right American groups and on English-language, pro-Trump Twitter accounts. They were then relayed to WikiLeaks. En Marche! confirmed the hack, saying it had been the “victim of a massive and coordinated hack … which has given rise to the diffusion on social media of various internal information”. Independent journalist, Jack Posobiec used his large Twitter following to publicize the leak, prompting thousands of people to dig through the emails. The man who popularised the data dump says he was expecting it and was poised to spread it. 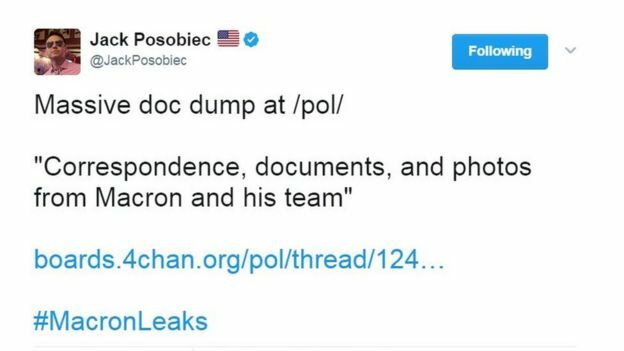 Fourteen minutes after the Friday leaks on 4chan, at 19:49 BST, Jack Posobiec, a journalist who writes for far-right Canadian outlet Rebel Media, posted a link to the thread to Twitter using the hashtag #MacronLeaks. “The same poster of the financial documents said to stay tuned tomorrow for a bigger story – so I pretty much spent the next 24 hours hitting refresh on the site,” he told us.